DNIPROPETROVSK — While visiting Canada several years ago, I saw Halyna Mazepa’s paintings displayed in a number of Ukrai-nian-Canadian homes in Toronto and Ottawa. Her style is captivating, you can’t mistake it for anybody else’s. It is colorful, innately ethnic, reflecting the world’s creative experience. Halyna’s father, Isaak Mazepa, was a reputed Ukrainian politician, and head of the Ukrainian National Republic government in 1919. He was a professional agronomist and public figure from Kostobobrov, a village in the Novhorod-Siversky povit (present-day Semenivka raion, Chernihiv oblast). Interestingly, the Russian journalist Anna Politkovskaya, murdered in 2006, was born in New York in 1958 as Hanna Mazeppa (a.k.a. Anna Mazeppa). Her father, Stepan F. Mazepa, was also born in Kostobobrov and was a member of the Ukrainian SSR’s mission to the United Nations. Thus there were two Mazepa families from the same village. Perhaps they were related? Isaak Mazepa was one of the leaders of the Ukrainian Social Democratic Labor Party (USDRP) in 1905. As a young man, he was an active member of the Ukrainian student community in St. Petersburg. Prior to the [October 1917] revolution he worked as a professional agronomist. He settled in Katerynoslav in 1915, and was a member of a food supplies committee. In 1917, he became a noted political figure in the Katerynoslav gubernia. In 1919 he was a member of the Labor Congress and the secretary of the USDRP Central Committee. In April of that same year he was appointed Minister of the Interior, and, in August, head of UNR government (while holding this post he took part in the Winter Campaign). In May-June 1920, Isaak Mazepa was Minister of Land Affairs. From 1923 on, he was a university lecturer in Czechoslovakia. Ditto in [West] Germany after 1945, holding the additional position of associate professor at the Ukrainian Economic Academy. After WWII Isaak Mazepa was one of the organizers of the Ukrainian National Council. He wrote three volumes of memoirs entitled Ukraina v ohni i buri revoliutsii (Ukraine in the Fire and Storm of the Revolution), covering the period from 1917 to 1921. Isaak Mazepa’s wife, Natalia Sunhalevych-Mazepa (1882-1945), was from Kamianets-Podilsky. She was a professional bacteriologist and public activist. As a student in St. Petersburg, she was an active member of the local RUP-USDRP [Ukrainian Revolutionary Party and the Ukrainian Socialist Democratic Workers’ Party, accordingly — Ed.]. She worked as a bacteriologist in Katerynoslav, Volyn, and in Prague (starting from 1923). Her research papers were published by Czech journals. She published a social hygiene textbook in Ukrainian. She died in Prague at the beginning of 1945. Isaak and Natalia Mazepas’ daughter, Halyna Mazepa-Koval, was born in St. Petersburg, on Feb. 9, 1910. Shortly before her death, in the fall of 1992, Halyna Mazepa responded to my letter asking her to share her childhood memories about Katerynoslav and her teacher Mykola Pohribniak. The following are excerpts from her message. “…My fondest Ukrainian memories are of Katerynoslav. We used to bathe in the Dnipro — Dad, Mom, and I. My nanny and Tetiana [her sister — M.Ch.] used to take me in my baby carriage to the [local history] museum, past all those primordial, mysterious stone babas. Inside the museum, I was greeted by wolves snarling from their lairs [the museum’s nature study section — M.Ch.]. In your letter you mention my sister Tetiana. She died of pneumonia in Bohemia a long time ago. My mother died in 1945, when the Americans air-raided Prague. [What remained of her and both our boys] was found in a bomb crater. Having lost our children, my husband, Volodymyr Koval, and I left Bohemia, along with the remaining Ukrainians, never to return. We lived in Germany and in Paris for a while, then we settled in South America with our son, Bohdan. The second son, Ivan, was born in Venezuela. Bohdan is an architect and Ivan is a lawyer. We have six grandchildren, two of whom are also architects. “In Katerynoslav we had a home on Baseina Str. [currently: Pisarzhevsky Str. — M.Ch.]. There were army barracks round the corner [former army barracks in Feodosia, currently the campus of the University of Law on Gagarin Prospekt — M.Ch.]. I grew up as a hefty girl, as I used to spend my days climbing and sitting on top of the big wooden gateway, watching army men enter and exit the barracks. When the Ukrainian army came they closed the kindergarten where my mother had enrolled me and our nanny Kylyna’s daughter Antosia. Kylyna continued to look after Tetiana. “The Russian soldiers left, singing their traditional army march song ‘Nightingale, my bird, /Leaving the canary/Sing her a farewell song.’ Later came men clad in blue army coats. They sang ‘Cossacks rose at dawn… .’ In turn they were replaced by the chornoshlychnyk — cavalrymen clad in black, with black round hats, astride black horses. “A gymnasium high school was re-opened and I was enrolled instantly, thanks to my freedom-loving relatives and my mother who had taught me the ABCs before I was seven years old. At one time we decided to stage Lysenko’s Koza-Dereza. Everyone was enthusiastic about the project. Women started running around the piano. One of them must have been a music professor, considering that a nice boys’ choir had been assembled, along with the cast. My mother took an active part in the project, although she had a number of responsibilities as a school physician. That was probably why I was assigned the role of Sister Fox. I can’t recall any other professors, but I remember the name of Petr Yefremov being frequently mentioned at home. Koza-Dereza proved a big success. “My mother, as the high school’s staff physician, arranged for Pohribniak, a young professor in the field of fine arts, to give me private lessons. In my father’s study a glass of hot tea would be placed on the desk for the professor, along with jars of cold water, paintbrushes, and watercolors. The professor painted a landscape with a thatched village home and a garden packed with sunflowers and mallows. I observed him while he worked, sipping his tea. “Russians came again. My father was arrested, then released. My mother was given a leave of absence (at the Institute of bacteriology) and told to go as far as she could with her children. Mom chose Feodosia with its wild beaches, in the Crimea. We lived in a cabin by one such beach. When it got cold, with Katerynoslav still under Russian rule, my mother decided to settle in with her sister Lidia, whose husband was a mining engineer. We spent the winter there. When the snow started melting we made a precarious trip back to Katerynoslav, across the Dnipro’s cracking ice fields. We stayed there until 1921, when a heavy spring hail storm smashed our double-frame window panes. Starting in 1923 the Mazepas spent over two decades in Prague. After graduating from a Ukrainian high school in Prague, Halyna Mazepa enrolled in the State Artistic-Industrial School in 1929. She was dreaming of a trip to Paris, but this required money, so the artist illustrated Prague’s burlesque magazines and designed the front and back covers of a number of ladies’ weekly publications. Eventually she collected enough money to visit Paris, fulfilling her cherished dream. Together with Volodymyr Koval, her future husband, she explored local historic sites, and all those masterpieces of art and architecture. There she met former Katerynoslav resident Ivan Rudychiv, curator of the Simon Petliura Library. This old and half-blind man was happy to see his old friend Volodymyr and his fiancee Halyna. Back in Prague, Halyna Mazepa took part in large-scale compound Ukrainian art exhibits, held also in Berlin and Lviv. Her works of art were published with big print runs. In 1939, she married the engineer Volodymyr Koval in Prague. They had two sons, Volodymyr and Yurii. Among their frequent family guests was the gifted Ukrainian painter Mykola Butovych. Researchers point to a strong similarity of their creative approaches. Butovych’s album of wood prints entitled Ukrainski dushy (Ukrainian Spirits), was published in Leipzig, in 1924. His characters are borrowed from Ukrainian tales: witches, wizards, poltergeists. Halyna Mazepa published a series of color leaflets with Ukrainian mythological characters in the early 1930s. She kept receiving commissions for Ukrainian book illustrations from Lviv. She also proved a successful costume designer in a number of drama productions. Critics referred to her as a national modernist, as the themes of her work were taken from national culture and folklore. 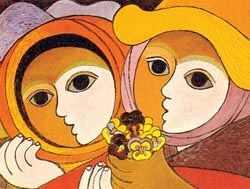 After WWII, when she and her family had to leave Europe and settle in Venezuela (towards the end of 1947), Halyna Mazepa found herself in a tropical country, amidst a bright array of colors. This period of her creative life is generally considered as the most productive, with a large number of works, including the Ukraine-oriented pictures Vorozhinnia (Fortune-Telling, 1946), Rusalky (Mermaids, 1948), Hutsulska maty (Hutsul Mother, 1972), Mavka (The Rivermaid, 1977), Try zhinky (Three Women, 1977), to mention but a few. In 1956, her picture in relief of the Mother of God spreading her Protective Veil over a Cossack riverboat won the National Salon’s Grand Prix. She received the award from the President of Venezuela himself. With this prize-winning piece, and other works of art, she tried to familiarize her host country with her beloved Ukrainian themes and traditions, doing so with singular talent and hard-earned money. Halyna Mazepa died in Caracas in June 1995. She lived to see her memoirs published in Toronto (1993). Her memories about Ukraine are centered around Katerynoslav, for it was from that city that she, then an 11-year-old girl, started traveling across the world.